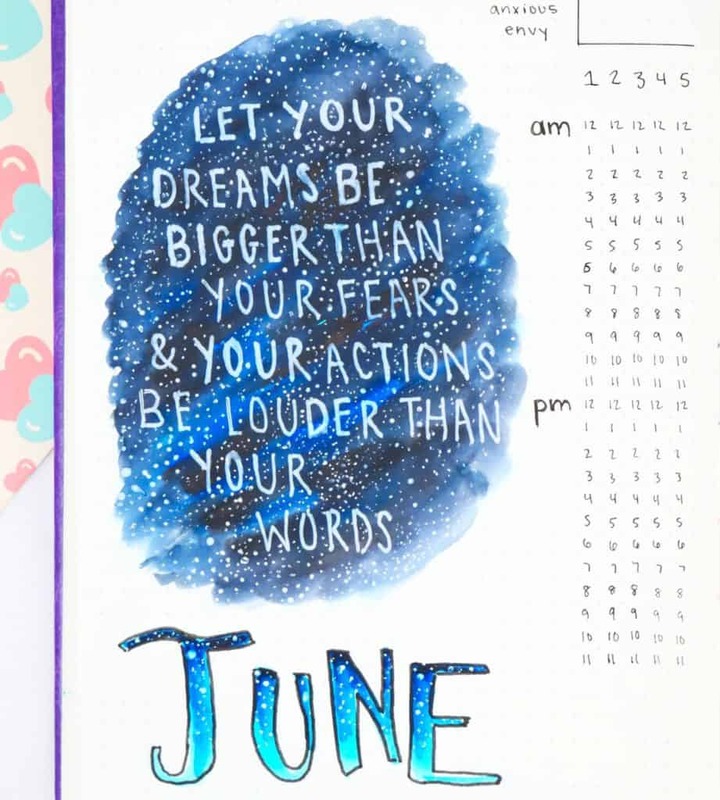 School is ending, the weather is fabulous (at least, for those in the Northern Hemisphere), and I can’t think of anything better than to work on my bullet journal for June! 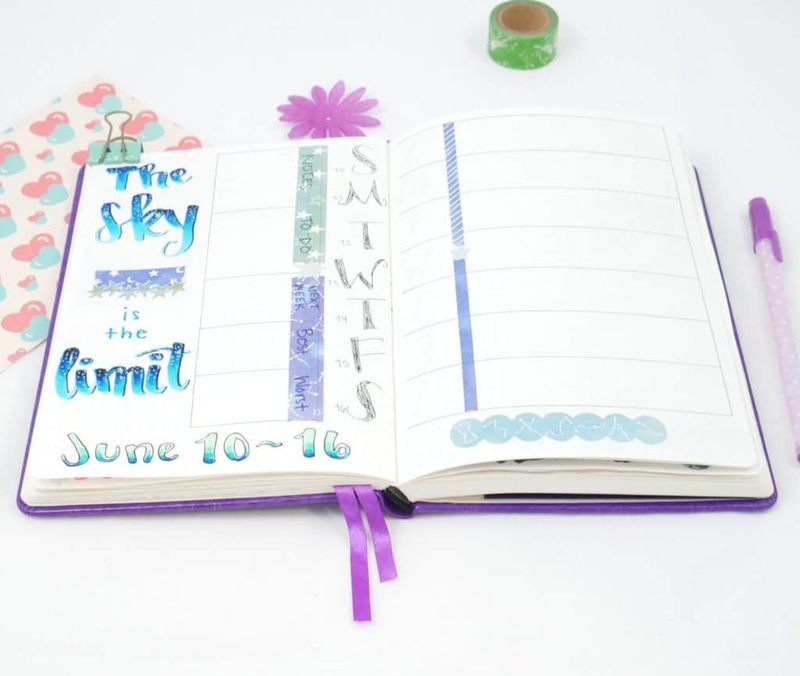 Maybe I’m partially kidding, but hey, if the weather isn’t nice or mosquitoes are out, those are great times to dive into my bullet journal. Bonus points if you take your bullet journal outside to decorate! Anyways, very excited to share my June 2018 Plan with Me with you! 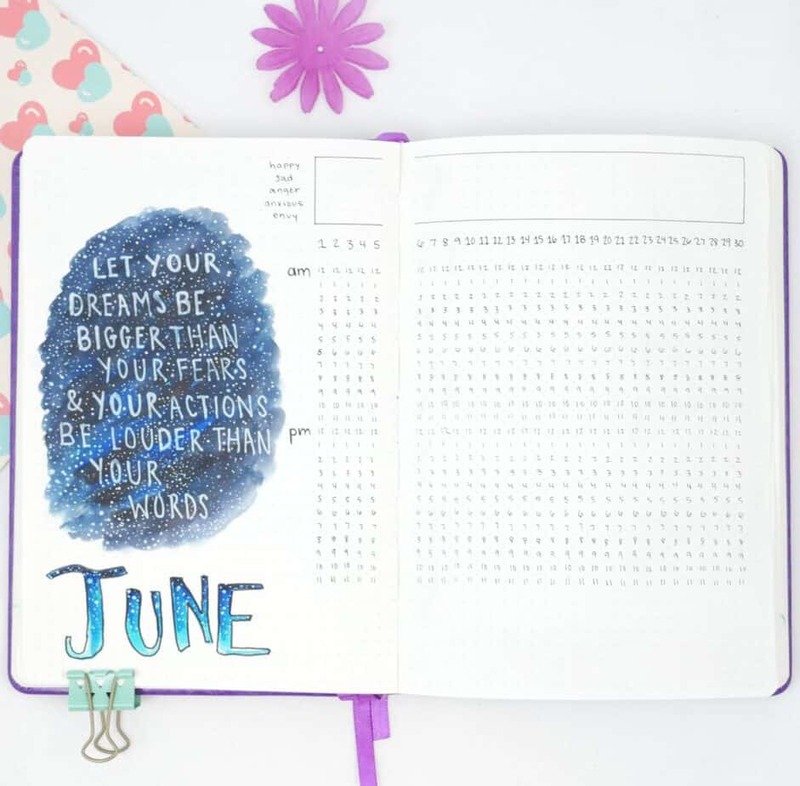 If May was all about simplifying, June is proving to be all about fun. 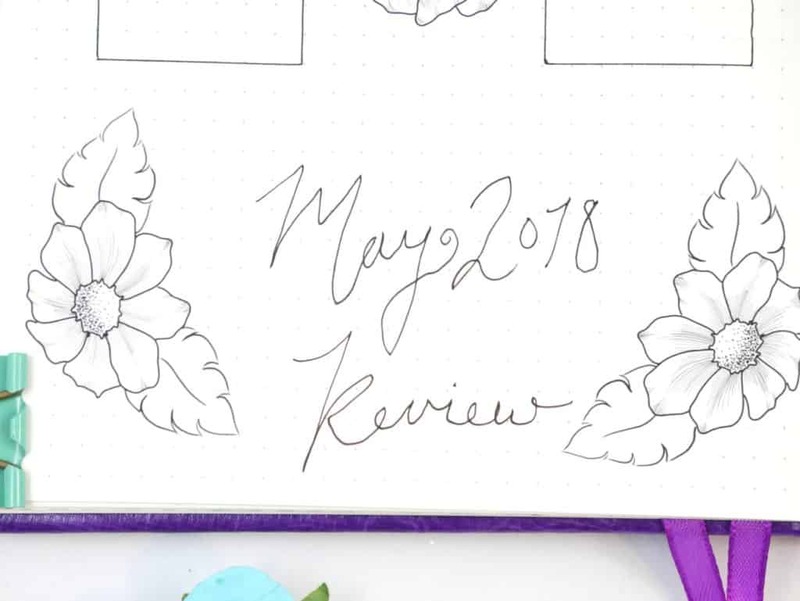 I had a week off toward the end of May, so I wanted to really enjoy setting up my bullet journal for June 2018. 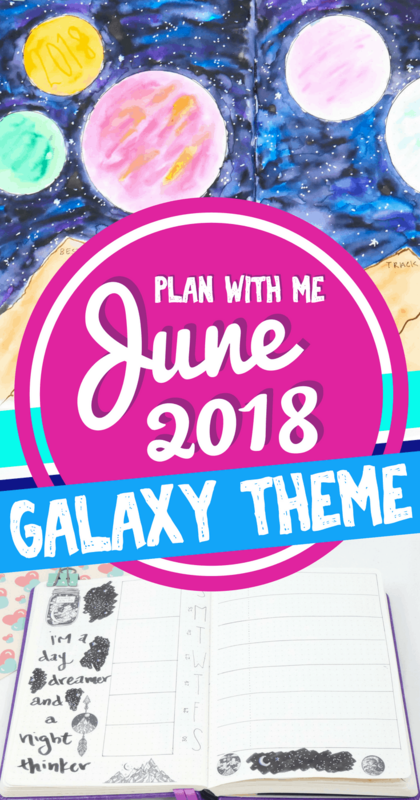 My friend Kim over at @bumblebujo picked out a ‘Galaxy Theme’ for May, and it was absolutely phenomenal. It was so beautiful that I chose it for my June theme! Galaxy themes are amazing because they can be detailed or minimal, complicated or easy, and everybody has a different perception of space. It’s vast, and you can spread your imagination as far as space goes. Which is like, forever. Usually, I like to start off with how the previous month went. But due to some really amazing, INCREDIBLE news… I’m actually going to stick that section on at the end. 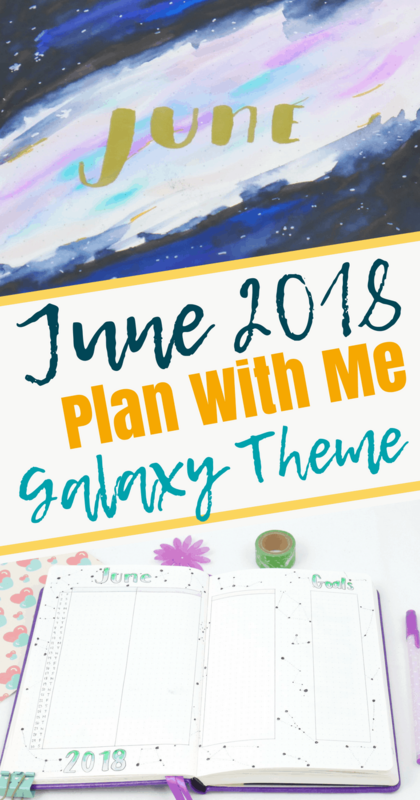 Now for the June 2018 Plan With Me! This hands down is my favorite cover page I’ve EVER created. Not only was it a BLAST to create, but it turned out amazing. 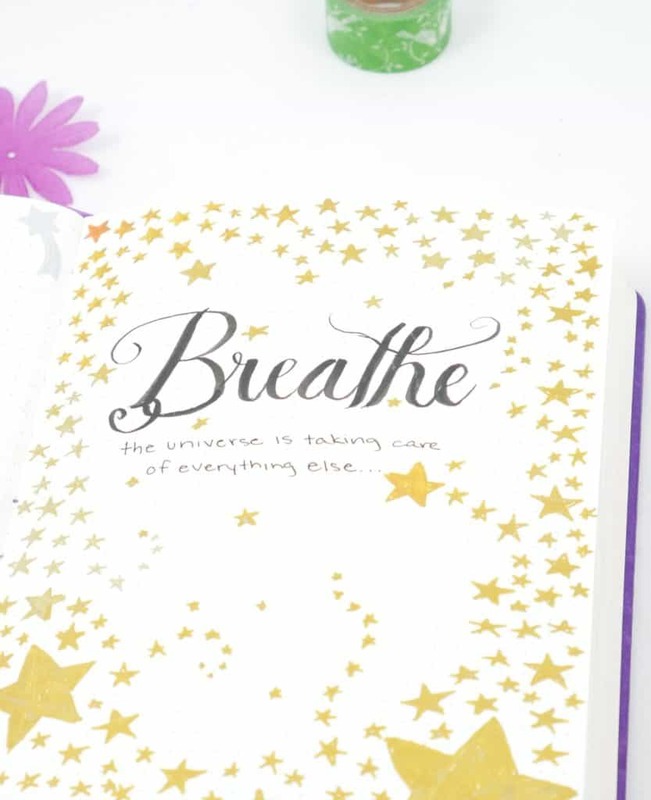 With the exception of the stars and month, everything was created with Tombow Brush Pens and a watercolor brush. As complicated as it appears, it was literally as simple as coloring in the space and then using the water brush to blend. Though, if you’re going to try to emulate this, do the lighter middle section first. The water brush does make the page wet, but I have to admit the Scrivwell notebook handles watercolor extremely well. There was no bleeding. The only unfortunate part about watercolor is that it did lead to some wrinkling. However, that’s just the name of the game. I really branched out for my monthly layout for June 2018. In past months, such as April and May, I stuck to a more traditional calendar. While perusing on Instagram one day, I found a really intriguing monthly layout that I wanted to try. Unfortunately, I did not think to save it, so what I created was an emulation of what I remembered. What I like about this month’s calendar is that it’s a lot easier to make. I have three sections that I can monitor for dates and events, and I also have an area for tasks I’d like to complete for the month of June. I went with simple black and white constellations for the design. All of the constellations are real, too! In fact, the constellation directly behind the month of June is ‘Gemini’. Pretty neat, right? 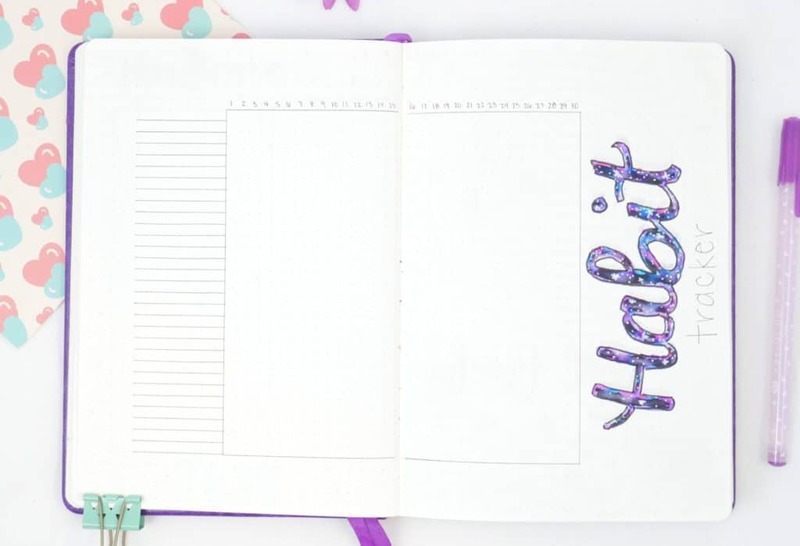 For June’s habit tracker, I stuck with a similar look to last month’s tracker. It’s a nice design that allows a lot of space for creating beautiful tracking spreads. In the past, when I’ve done one-page trackers I’ve felt like the space on the page can get a little crowded. No pun intended. I kept the decoration very simple for this tracker. I wanted to try and emulate the concept of the cover page, but this time with lettering. After laying out the colors using Tombow brush pens, I used the water brush to blend the colors. The water brush was also great for keeping the lettering neat and clean. I outlined the letters with a pen once dry. I used a white gel pen to create the stars, much like I did with the cover page. Big change from May! I separated the mood and goal tracker. While it was a cool look initially, I found the combination tracker looked messy once filled in. My mood tracker follows a color intensity scale. The more intense the color, the more intense the mood. Yet, the goal tracker did not follow the same color intensity scale. I found it confusing to separate the trackers. Also, with both trackers on one page, space got tight quickly. So, I dropped the mood tracker off this month’s version. 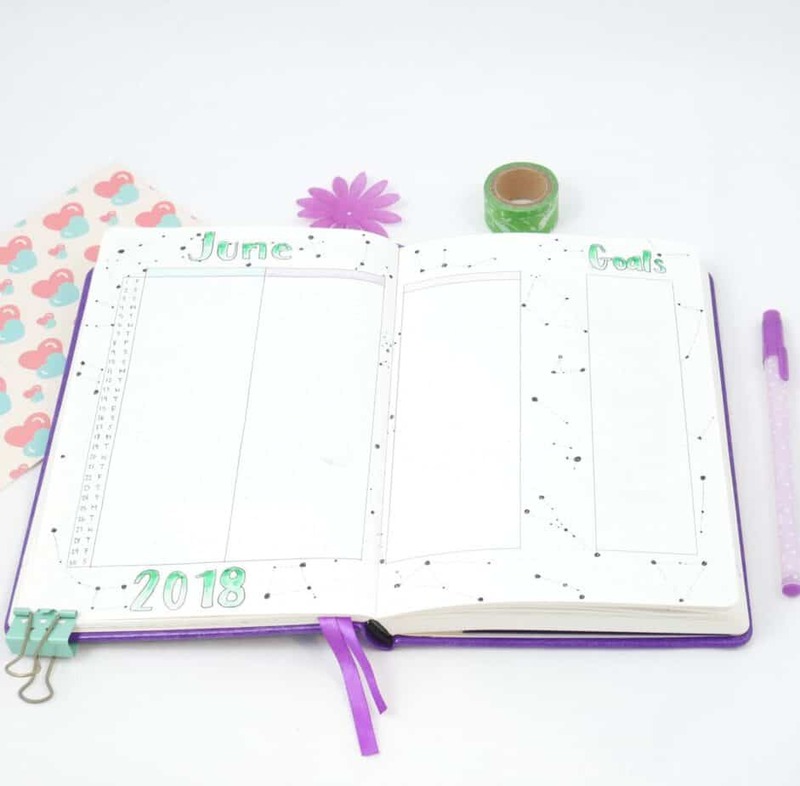 This page for June 2018 will only be goal tracking. I kept the design simple; I used pretty silver stickers that I got in my April Pipsticks sticker subscription pack. (That’s how I actually got the idea to do a space theme in the first place!). Here is another significant change from previous layouts. I moved the time tracker to a two-page layout instead of the one-page layout. With all the extra space (again, no pun intended) I easily fit in the mood tracker. In May, I chose to transition my ‘sleep tracker’ to a ‘time tracker’. I did this because with all the work I made creating the spread, I may as well use the entire space. As you can see, I’m head over heels for this galaxy look. I used shades of blue and black in my Tombow Dual Brush Pens, then used the watercolor brush to blend the colors. I used the white gel pen for the quote. Instead of using the gel pen for the stars, this time I wanted smaller stars on the design. I was worried that stars made with the same pen I created the quote with wouldn’t look quite… right. I used an inexpensive watercolor palette and wet the white paint with some water. Then, I used a toothpick to create smaller stars. I’m not sure if I will use that particular technique again, because it was a lot of work and the paint was pretty hard to control. As you can see, it still turned out beautiful. I choose to make all my weekly spreads the same because it’s easier than trying to pick four separate layouts for the month. I went with a simpler layout than previous months, because I wanted to have some more fun with decorating them! While complicated layouts are fun, I do find it can make for some tight space to decorate around. Seriously, what is with all these space puns?!? I couldn’t help myself. I had to go galaxy again. This time though, I wanted to try to add some planets to the mix! 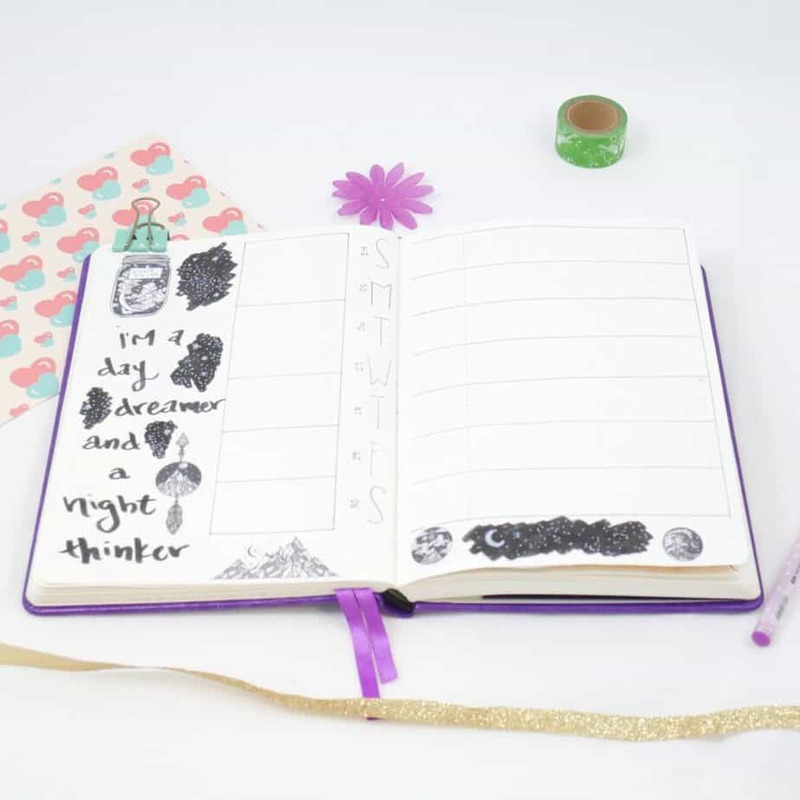 I was so enamored by this spread from @bumblebujo that I wanted to give it a go with the review page. My initial intention was to have the areas I write in to be on the planets, but I decided to put those sections in the mountains instead. Speaking of mountains, any guesses on July’s theme? I’m not normally one for extra pages, but this month, one snuck in there. With the change of many of my tracker layouts, I found myself with an extra page. What do I turn to when I need to fill extra space? Quotes! I love putting quotes in my bullet journal. Personally, I always try to make them relevant to my current situation. 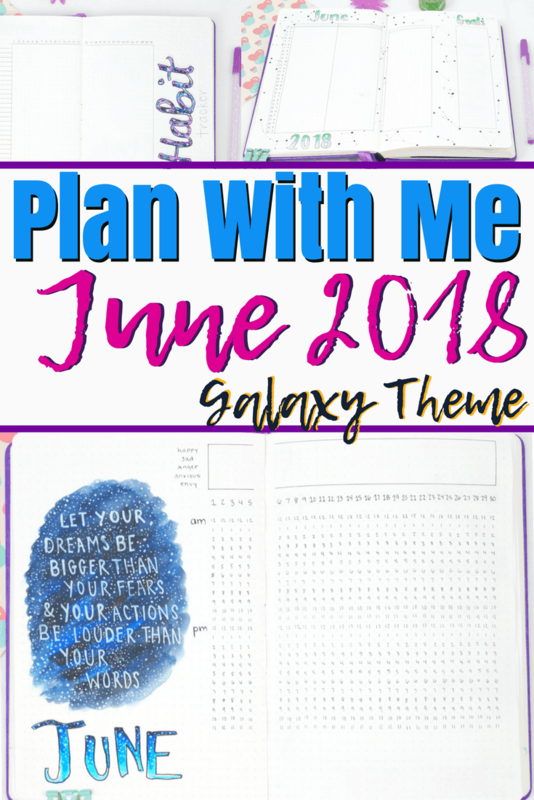 Did you get a chance to see the plan with me for May 2018? 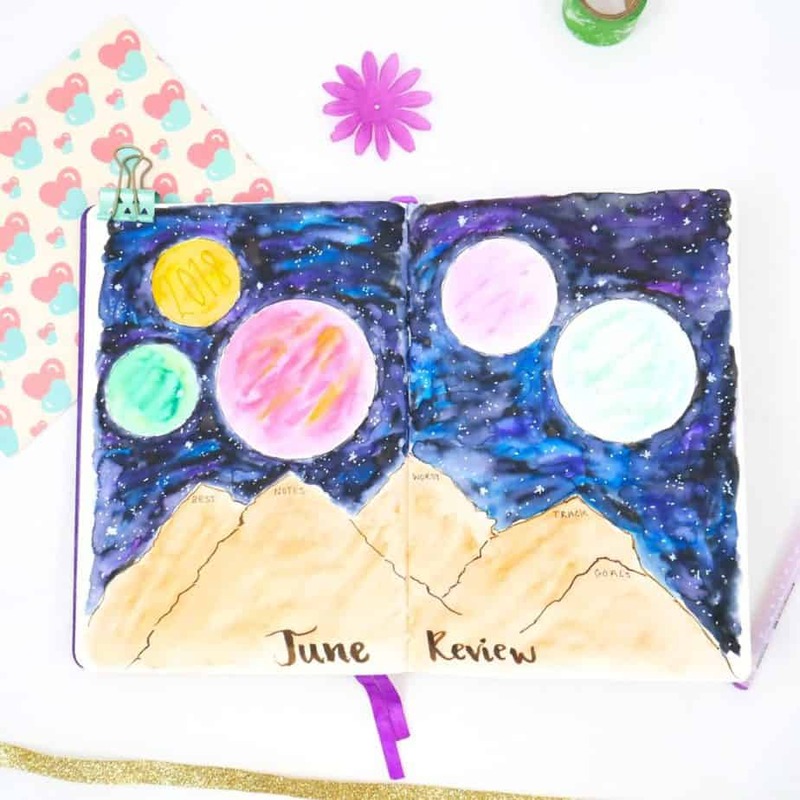 Each month I like to take a moment to dive into how the last month of my bullet journal went and explain some of the changes I made for the upcoming month. Honestly? May was embarrassing. It was fun to create and I had a lot of enjoyment creating the spreads. But I hardly touched my bullet journal the entire month. Ugh. So embarrassing! Part of that is circumstance. Between a huge work project that’s eaten up more of my free time, I haven’t had as much time to work on things as I would have preferred. Thankfully, a missed day, week, or month is never something to worry about. Creating it was extraordinarily relaxing during a busy period of my life and it helped me manage large amounts of stress. Biggest Changes between May and June? 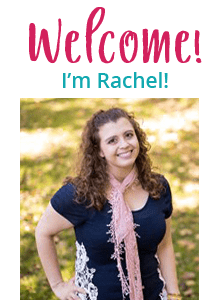 Well, you may not know this yet, but Planning Mindfully is going full time starting in the middle of June. What does that mean? It means I’m leaving my full-time job. In all honesty, it’s terrifying! 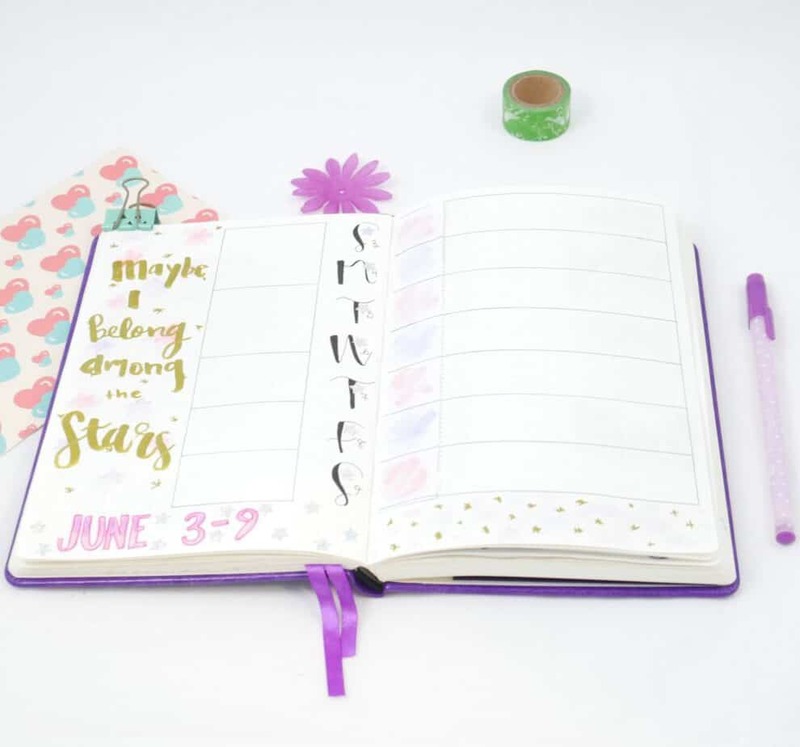 But in a bullet journal sense, that means my time management needs for the beginning of the month could be vastly different than the end of the month. 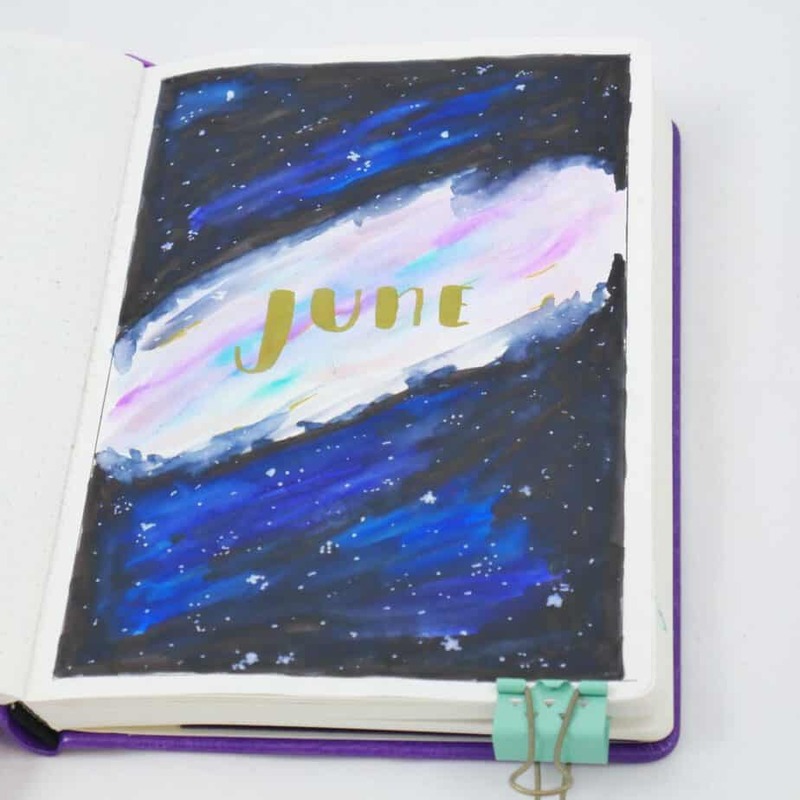 So I chose to have fun with my bullet journal spreads for June! As you can see, I tried new layouts, I made fun art, and I’m going to allow myself the opportunity to be flexible. Creating simplicity in my trackers is an easy way to make adjustments if changes come in my daily schedule once I leave my job. 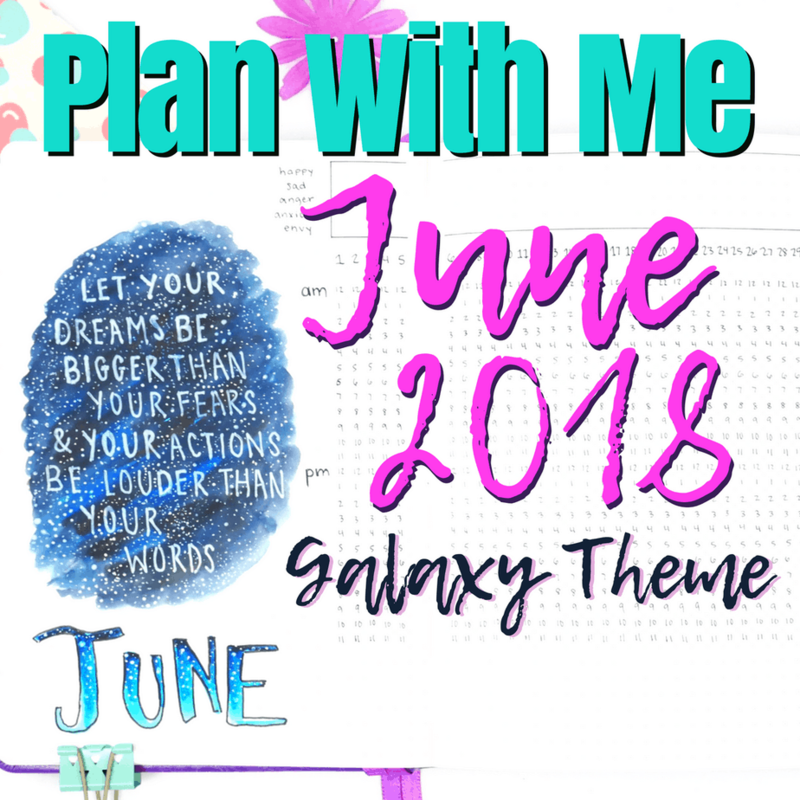 Now it’s your turn to get involved with the June 2018 Plan with Me! 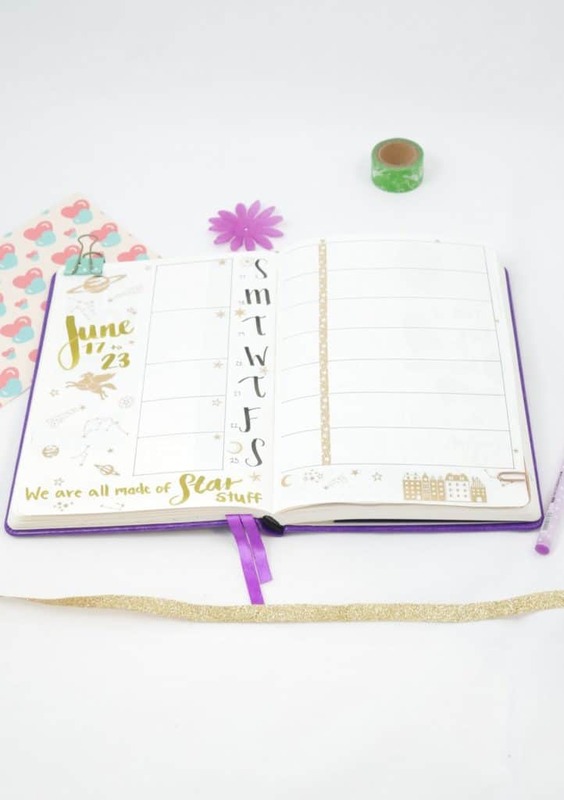 What was your favorite spread featured in the June 2018 Plan with Me? Would you like a tutorial to make a galaxy background? Please let me know in the comments, and feel free to make suggestions for future Plan with Me themes! Please share this on Pinterest if it inspired you! I would love a tutorial. That is so pretty. 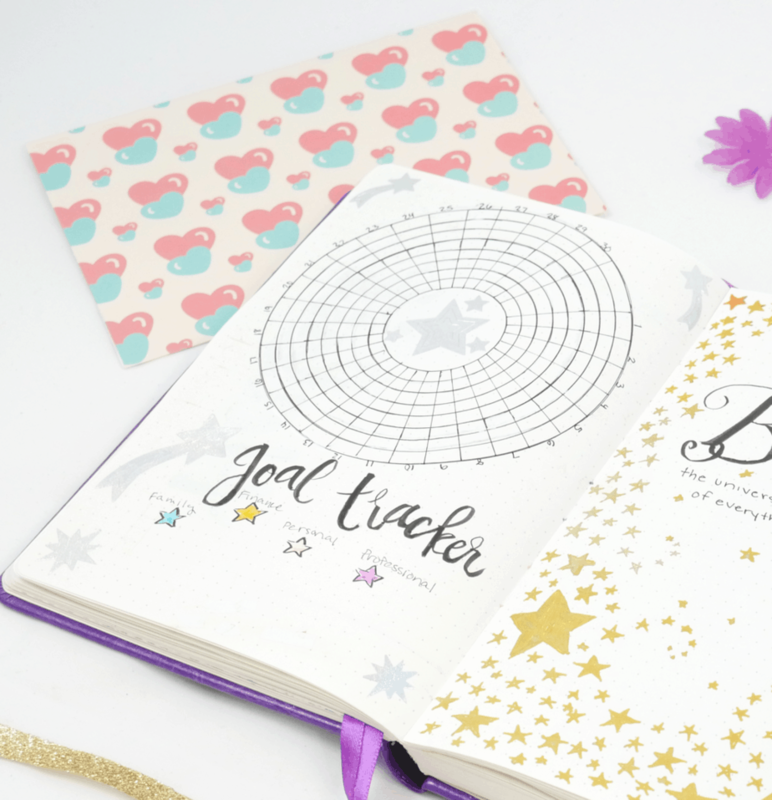 Do you have any tips for discbound bullet journalers or bullet journalers that use a hybrid planner/bullet journal like the happy planner?